Kiddville Ranch. Site of Historical Gold Mining Camp. Pets are free! House, 3 Bedrooms, 1 Bath, (Sleeps 6) on 38 private acres! Kiddville was a small gold mining camp in the days of the settlement of the Black Hills IN THE LATE 1800's! It was then abandoned after the gold rush. The vacation home originally was the two story miner's boarding house. The boarding house was then converted and re-modeled into a modest family home in the 1930's, and the property became a private, 38 acre, ranch/homestead. The location is 9 miles NW of Custer. Six of these miles is well maintained gravel. For motorcycle guests, parking is available near the highway if guests have a car to then travel from there to the home. The second floor of the Vacation Home hosts the three bedrooms and the full bath. The main floor consists of a living room, kitchen, dining room, laundry area, porch, and small sun room. Two of the bedrooms have queen beds. The third bedroom has two twin beds. The original homesteader/ranchers (my grandparents) from the 1930's lived in the house for 75 years till 2007! The home is located on 38 privately owned acres; no other inhabited dwellings. Solitude for you! 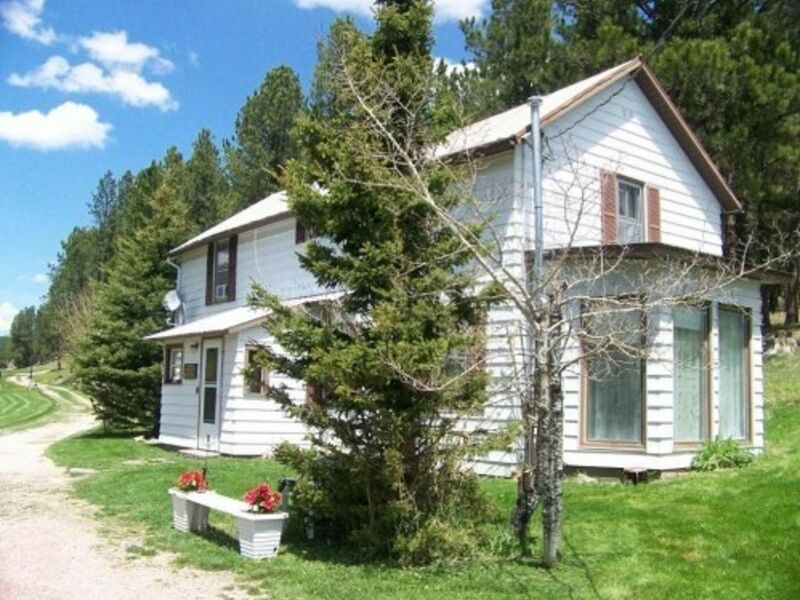 This acreage is located in the heart of excellent National Forest deer/turkey/elk country. There are no other inhabited dwellings on the 38 acre property. Ranch cattle may be found grazing on some of the (fenced) acreage. The five acre yard hosts no livestock. Historic buildings yet on the property are a mine assay office, caretaker's house, a barn/corral, and cabin. The homesteaders of the 1930's were my grandparents and the property is a treasured part of the family that we wish to keep. It is our hope that it will become one of your valued memories as well as you stay at an original Black Hills Gold Mining Camp and homestead. Though the house is completely modernized, it yet holds a peice of the past that is becoming difficult to find. The modest home is like 'visiting grandparents on the farm', as many of our guests say. It is a friendly, down to earth atmosphere. Each of the old buildings in the yard has a sign on the door telling what part it played in the old west. The houseyard is adjacent to Public Black Hills Forest land, and surrounded by our own private ranch acreage, so you may hike and explore to your heart's content! Wildlife visits regularly (deer, turkeys, elk, squirrels, songbirds,...). And if you have not experienced the clean smell of pine trees or the sound of silence, or a view of the stars without street lights, you are in for a treat! *A yard light is available if you like too! The location is at 6000 feet altitude in the protected southern Hills, so the weather is the best you will find in these parts! There are two window AC units in bedrooms upstairs. Generally, though, the home is quite pleasant with just a breeze through an open window! Window air conditioning in two bedrooms and the living room. Elevation is over 6000 feet and generally cool. Large private yard on a dead end driveway. WiFi - no password needed and no nearby neighbors that share it. Stocked with the basics (salt, pepper, sugar, ketchup, mustard, some other condiments...), and with utensils, dinnerware, cookware, glasses, cups,coffee maker & grinder...and ice maker. Very small porch for kicking off shoes, or drying off pets. Many of the old buildings from the gold mining camp days and ranch days are yet on the property including the gold assay office and barn built in 1895! There is a small creek running through the yard. Many guests are visited by local wildlife in the morning/evening including deer/elk/turkeys. This is a secluded, quiet get-a-way after a day of touring that is enjoyed by children, pets, and adults alike! Our time at Kiddville Ranch was the most relaxing vacation ever! The Kiddville Ranch house was very homey and comfortable with more than enough room for my husband, me and our mid-sized dog. The beds were very comfortable, the appliances available worked great and the decor just fit the feeling of the place. Even the tap water tasted good! There was WIFI and TV available, but because we wanted to "unplug" from the world, we spent most of our time exploring the grounds and buildings and hiking through the property and beyond. A history of the house was available to read which really added to the experience. The location is great, we could easily visit Crazy Horse, Custer Park and the other attractions in the Black Hills. But I think the best part of our stay was the sounds to be heard each day. In the mornings and evenings,we listened to the trumpeting of elk in the distance, the chirping of so many different birds and the breezes that blew through the birch trees that almost sound like delicate wind chimes. We even heard an owl at night. It was truly magical. We didn't want to leave, it was such a great place to relax. We enjoyed our stay very much. House is secluded and quiet. Very peaceful area. Owners were great and very welcoming and helpful. The Kiddville Vacation home was ideal for my wife, our dog and me during our 3-night stay. The house was as inviting as a home should be, and its location is ideally suited for anyone seeking a "peaceful getaway" experience, yet conveniently located to major attractions, i.e., Mt. Rushmore and Crazy Horse memorials and local towns (Custer, Keystone & Hill City) and Custer State Park. But regarding the latter, we found that hiking opportunities are just as plentiful on the portion of the Black Hills land that lies adjacent to Kiddville. Just open the gate and start hiking! As for the house itself, we found it charming and comfortable, yet not lacking in modern conveniences. (The WiFi was incredibly strong!) Very impressive for a structure with such a rich and interesting history. Finally, our host, Kay Baumann, who lives nearby couldn't be sweeter, and she proactively met our every need. We are grateful for our stay at Kiddville...just wish it could have been longer. This was a stroke of luck to find at the last minute. When we arrived we were greeted by Kay, who warmly welcomed us to her childhood home. We were pleasantly surprised with the beautiful, private and historical place. There is history everywhere with postings to find to tell you about all of the buildings and treasures. The wildlife watching was also plentiful. Kay and Patricia didn't miss anything. Everything you need, and more, is provided. We hope to return for a longer stay in the future. This is such a peaceful, quiet place. We really enjoyed staying here and it was a great place to wander around with our dogs. The history of the place is fascinating. I wish we could have stayed longer! Access from large yard on to the Black HIlls National Forest. Great for hiking/exploring! The home is located 8-9 miles NW of Custer, SD. Six miles of this is well maintained gravel. During Bike Rally, there is parking near the highway if guests have a car to take to the home from there. The home is a modest, clean, friendly ranch house, converted from an 1895 Boarding House in a gold mining camp. A small creek runs through the yard. Wildlife is often seen through the windows during dusk and sunup. The home is very remote. There are no neighbors, no street lights, no sound of traffic. A great get away after a day of touring!